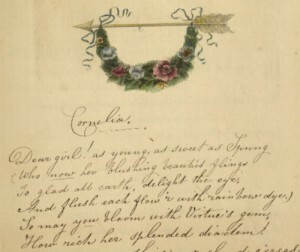 April is National Poetry Month in the United States and April 18 is “Poem in Your Pocket Day” so today we are highlighting two poetic items from our collections. And flush each flow’r with rainbow dye. How rich her splendid diadem. You can read the whole poem on this page or browse through the whole album here. By Him who reigns and hath forever reigned. To cheer the mourner with ecstatic notes. “Son of a sainted mother! take and read! 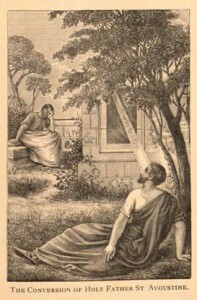 Read the entire poem on this page or browse through the whole book The Conversion of Saint Augustine and Other Sacred Poems. You can find more poems by searching our Digital Library collections. Happy Poetry Month!